What do you get when you combine a love of tea and whiskey? Magic. And a smoky Lapsang Souchong Infused Manhattan that is stiff enough to put hair on your chest, but sweet enough to share with your mom. The smokiness is subtle, but will surely send you dreaming about campfires on Lake Michigan. I have the tendency to over-complicate cocktails, eyes wide at options before me, but in this version of a manhattan I chose to keep it simple. Brew an extra-strong batch of Organic Lapsang Souchong Black Tea. Instead of 1.25 teaspoons per 8oz, double the amount and do 2.5 teaspoons for 8 oz of tea. Brew the tea and set aside to cool for a bit. 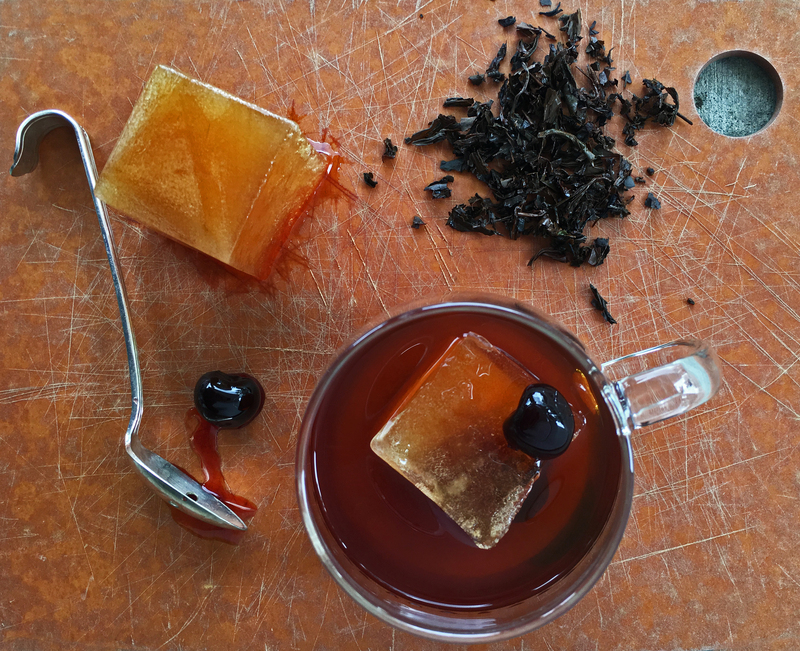 Once the tea is about room temperature, or not scalding, pour the tea into an ice tray. Extra points for fancy cocktail ice cubes! Once your cubes are frozen, pour 3oz of your favorite rye whiskey into a cocktail shaker. We like Michter's Rye. Add 1oz of sweet vermouth, and 2 dashes of Angostura bitters. Add 1-2 Lapsang ice cubes. Cap your shaker and shake it up! If you don’t have a cocktail shaker, you can do this in a cup and stir it with a spoon. Pour the mixture into your drinking vessel of choice, and add a cherry for garnish. We like “Filthy Food” black cherries. For a little extra sweetness, add a touch of syrup from the cherries. by Chelsea Hohn and the rest of the Arbor Teas staff who let her test this out on them.